June 13, 2007, L. G. Crabo. 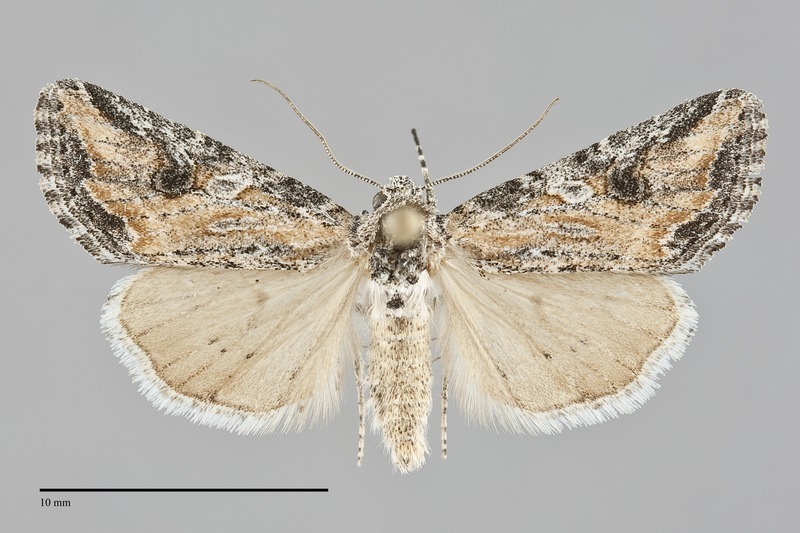 Hadenella pergentilis is a fairly small and light-bodied noctuid moth (FW length 12 - 14 mm) with a light orange-brown and gray forewing marked with a pale-filled oval orbicular spot and gray-filled reniform spot that flies in sage steppe habitats during most of the year. 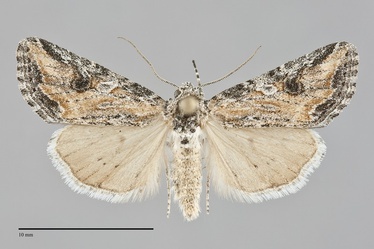 The costa, filling of the reniform spot, and terminal area are medium to dark gray while the rest of the wing is light orange brown with a few patches of gray along the trailing margin. The double transverse lines are evident as spots on the costa. The mildly irregular subterminal line is pale yellowish and preceded medially by a darker orange-brown shade on the middle and posterior portions of the wing. The orbicular spot is gray, moderately large, oval, and filled with whitish gray peripherally and darker gray centrally. The dark reniform spot is mostly filled with dark gray. The claviform spot is variable, most often light gray and filled with lighter and darker gray. The hindwing is warm tan, slightly darker toward the margin, with a small gray discal spot, a postmedial line evident as dark spots on the veins, and a white fringe. The head and thorax are mottled light and gray with weak stripes on the collar and tegulae. The eye is covered with fine hairs. The male antenna is filiform. This species can usually be identified by the combination of its small size, light orange-brown and gray forewing, and tan hindwing with a white fringe. 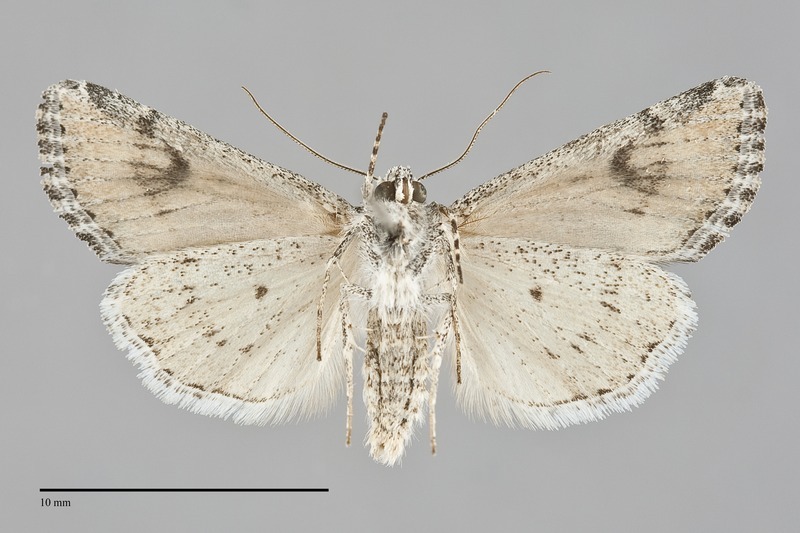 The most similar species, Afotella cylindrica, is powdery gray with a lighter hindwing. This species is narrowly restricted to desert habitats. It is often abundant on dry sagebrush steppe at low elevations in the Northwest, particularly in southeastern Oregon. It is less common in the Columbia Basin. Hadenella pergentilis is distributed in the dry central interior of the region from southern British Columbia through eastern Oregon, eastern Washington, and southern Idaho. The range is most restricted in Washington where it occurs only in the western portion of the central Columbia Basin not far from the Columbia River. This species extends from the Pacific Northwest and Alberta south at least to Utah and Colorado in the Rocky Mountain region and southern California along the Pacific Coast. This species has a very long flight season in our region, occurring from mid-April until mid-September. It is most commonly collected from late May through July. It is a nocturnal species and comes to lights.